In talking with my amazing friend Maha Bali (@bali_maha), I realized the connection between my skills as an instructional designer/technical writer and my desire to be a participatory researcher. I’ve always been challenged doing technical writing or instructional design projects where I cannot be the subject matter expert. It was one of the biggest frustrations in the iPad-fm.ca project – I enjoyed partnering with a subject matter expert, as I do that all the time, but that dependence on someone and that I could never be that subject matter expert. Looking back at the projects that I enjoy doing, and that I excel at, these are all projects where I was given the task of learning a new technology and then creating materials to teach others how to use that technology. 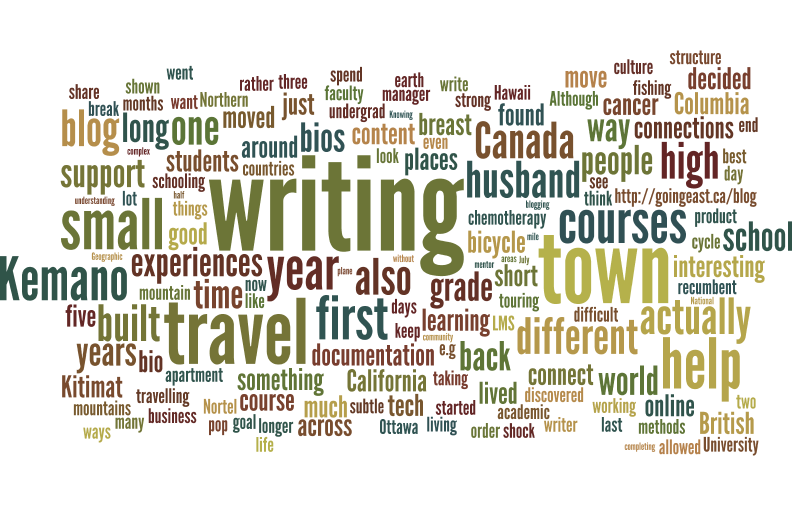 In chatting with Maha today, I realized that this also translates into the research that I most enjoy doing. I enjoy research where I am an insider. I like doing research with people rather than on people. It isn’t that I need to be the subject matter expert, more that it needs to be a possibility that I could become a subject matter expert. In the case of iPad-fm.ca, I was never going to be able to be a subject matter expert. I am not a physician. I could never be a physician educator the same way that a physician can be a physician educator. I would always be an outsider looking in. I would always need to partner with someone, but also, I would never know whether or not what I was saying was technically correct. I could not provide my own internal quality assurance – the quality would always need to depend on someone else. As I start looking at new dissertation projects, I’m aware that the projects I’m suggesting are all ones that I am an insider. I am capable of becoming the subject matter expert. This is a necessary condition for me to really engage in in-depth research. It is also something that I need in order to feel like my research is making a difference. I would call myself an exploratory, participatory, pragmatic researcher. Wow, that is a mouth full of academic jargon! First exploratory – I find the most interesting part of research is that of exploring new ideas. In the iPad-fm.ca project, I always believed that the most valuable part of the project was not the workshops, but rather the user stories – that is, the stories on how to effectively use specific iPad apps for teaching. The value in the research was in documenting these user stories. The process was exploratory. I worked with subject matter experts to explore how the iPad could be used in teaching. I helped them document these stories. Second participatory – I am a firm believer in doing research with people rather than on people. I see this difference a lot with social media analysis. I’m going to be challenged a lot over the next week at the Social Media and Society conference, were many people there do research on people, without really becoming part of the communities in which they are researching. This is definitely a fundamental difference in world views. Some ethnographers believe that you need to observe without interacting, so that you are being objective in your view. This brings me back to my issue with not being able to be the subject matter expert. I find that I need to feel that I could be an insider in order to really understand what I’m studying. I don’t believe I could ever be an objective observer, rather my observations are necessarily subjective and coloured by my experiences. Being an insider is the only way I will feel confident that what I’m saying is true. It is how I can ensure that my research is technically correct – something that I’ve always found I needed to validate in my instructional design and technical writing careers. I’ve always identified as a pragmatic researcher, in that I want my research to make some difference in the world – and a practical difference. I want to explore things in a way that the information can be used for some practical purpose (e.g. creating a course, teaching others, etc). Also, when looking at research methods, I look at the best ways to answer the research question, borrowing from a variety of methods and remixing them as needed to effectively answer the research question. When I add exploratory and participatory to my pragmatic world view, then I’m looking more at a higher emphasis on qualitative research methods such as ethnography and phenomenology – however, when I add my need to be an insider, I’m looking at auto-ethnography. I don’t think there is such a thing as auto-phenomenology! In addition, I’m a writer. I enjoy writing, and I’m also pretty good at it. This leads me to want to include narrative in my research – and my new favourite dissemination thing is semi-fictional narrative 🙂 So, perhaps my dissertation needs to be a semi-fictional narrative account of the impact of reading breast cancer blogs. I could write stories based upon the experiences of reading breast cancer blogs from different perspectives (e.g. the perspective of a newly diagnosed person, the perspective of someone who went through treatment several years ago, the perspective of someone with metastatic breast cancer, the perspective of an allied health care professional (e.g. nurse), the perspective of a breast surgeon, the perspective of an oncologist, etc). The list could be really long, such that I’d need to focus it a bit, perhaps to three different perspectives – each its own “article” – making up a dissertation by articles. So all you PhDers that are reading my blog, what do you think? What I think could work well for your research might be gathering ‘stories’ from different people on how cancer blogs have impacted them. You could then amalgamate stories or pieces of stories into a few different perspectives. For example, if you wanted to create a ‘perspective of a newly diagnosed person’ you might talk to a couple people who are newly diagnosed, but could also draw on what those who are more advanced remember about when they were first diagnosed, or what health care professionals suggest about those who are newly diagnosed. If you wanted to think pragmatically, you could choose perspectives based on who you think would benefit from your work – newly diagnosed people looking for support or health care professionals looking for resources to offer cancer patients, for example. In terms of framing it, particularly for your committee, could you go a bit more general? When I was first putting my proposal together, it started out as a “participatory ethnographic case study of rhizo15 drawing on a phenomenological approach using narrative methods”. My supervisor quickly convinced me that was too specific, ambitious, and a bit nonsensical. We reduced it down to “a phenomenological exploration of experience in rhizo15”, which gives some structures I need to adhere to but also gives me the freedom to approach from a variety of ways – using ethnographic methods, bounding it as a case study, capturing experiences as narrative, etc. Just my reflections while reading this over a cup of tea… not sure if it helps at all! Love love love the idea of writing from different perspectives! You could actually use some ideas from the blog impact study to help you reach the diff perspectives – would that satisfy your committee? You?